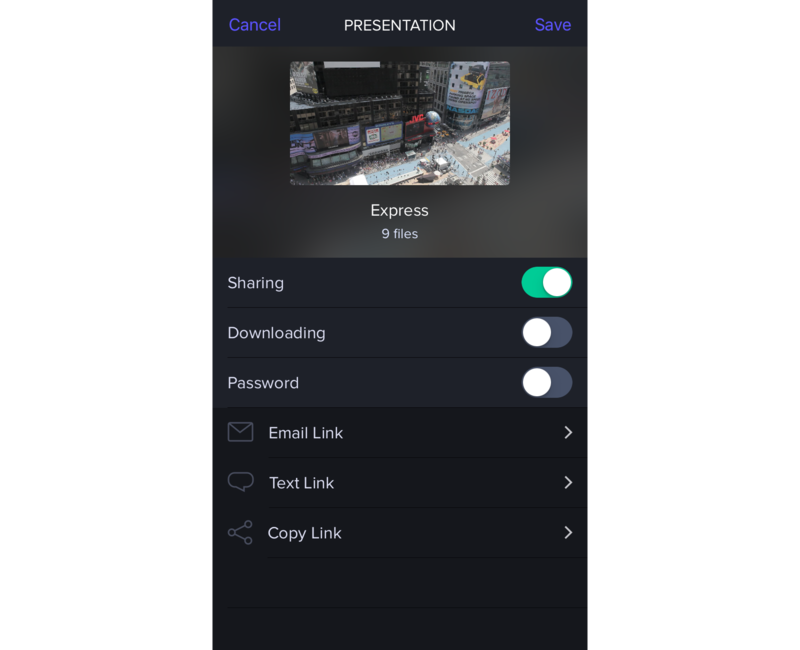 Share a Presentation page from the iOS app to allow your clients to only view clips without creating an account. Take a look at Review pages if you need them to leave comments. Tap Presentation. This will select ALL files from your root project level. If you want to share just one clip, select the three dots beside that clip tap Share and then Presentation. Sharing will be set to OFF by default for security reasons. When you turn sharing ON, a URL will be generated which you can then copy or share via Email and Text. You will also have the option to enable downloading or to password protect the link. Once sharing is turned OFF the link immediately becomes invalid. When the recipient opens the link from either their Email or Text it will open in their browser for viewing.